Modeled after Milan’s San Ambrogio Church, constructed in the 10th and 11th centuries, Royce Hall, named for philosopher Josiah Royce, was built in 1929 as one of the first campus structures. The acoustically stunning 1,800–seat theater housed in Royce Hall has played host to a veritable Who’s Who of performing artists, from George Gershwin, Duke Ellington and Jimmy Dorsey’s Band to Frank Sinatra, Ella Fitzgerald, Leonard Bernstein and the New York Philharmonic, Twyla Tharp, Frank Zappa, Mikhail Baryshnikov, The Philip Glass Ensemble and many more. 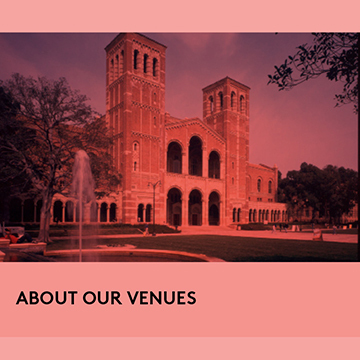 Home of UCLA’s acclaimed School of Theater, Film and Television, this building houses two intimate proscenium theaters, the 500-seat Freud Playhouse, and the 200-seat Little Theater. Macgowan Hall is located due north of the famed UCLA sculpture garden and next door to the ultra-modern design of the Eli and Edythe Broad Art Center. Schoenberg Hall is the 500-seat concert venue located in the Schoenberg Music Building, also home of the UCLA departments of Ethnomusicology, Music and Musicology. Named for 20th-century composer Arnold Schoenberg, who was a member of the Department of Music faculty in the 1940s, the building also includes a recital hall and the 144-seat Jan Popper theater. Powell Library, built in 1929, serves as the main undergraduate library for UCLA students and is one of the original four buildings that comprised the UCLA campus in the early period of the university’s life. Built in a Romanesque Revival style, the building resembles an ancient Roman basilica, specifically Milan’s Basilica of Sant’Ambrogio. It is named for Lawrence Clark Powell, the University Librarian at UCLA from 1944 to 1961. Intimate small-group performances are often held in the library’s warm and inviting rotunda. The park-like facility of Sunset Canyon Recreation Center offers year-round recreation for UCLA faculty, students, and staff and includes a 500-seat outdoor performance space. The facility also includes a 50-meter pool with diving facilities, a 25-yard family pool, picnic/barbecue areas, a sand volleyball court and 10 lighted regulation tennis courts. The SCRC is also home to both the UCLA men’s and women’s water polo teams, and is the primary facility for the UCLA diving team. Royce Hall’s immediate downstairs neighbor is located at the base of a picturesque campus landmark—the Janss Steps. The Fowler Museum explores global arts and cultures with an emphasis on past and present works from Africa, Asia, the Pacific, and the Americas. Home of local theater troupe The Actor’s Gang, this 100-seat theater is a Culver City historic landmark that is surrounded by ample parking and abundant eateries. A delicately restored, 1,600-seat movie palace from the 1920s with a massive, three-story grand lobby. Originated by Mary Pickford and Charlie Chaplin.